Users can acquire cell images and videos from different cell culture plates (up to 384 wells) in an incubator. Equipped with a fully automated x-y-z stage and multichannel imaging (three colour fluorescence — GFP, RFP and DAPI — and bright channel) and sensitive filter-based optics, the stage can be optimised for a variety of live cell assays. Time lapse images record the whole history of a cell from beginning to end. The image stitching functionality is suitable for analysing tissue sections or stem cell colonies in the entire well from individual high-resolution images. 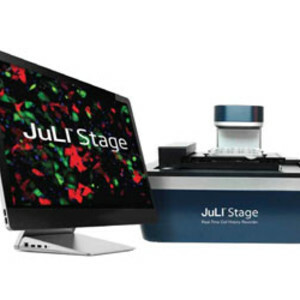 JuLI Stage software is easy to use and can be remotely controlled, allowing any user to monitor cell cultures and analyse experimental data from outside the laboratory. The product is suitable for monitoring cell proliferation, fluorescence expression, angiogenesis, differentiation and cytotoxicity, cell growth, migration studies, 3D spheroid imaging, cell viability measurement, wound healing, apoptosis and more. 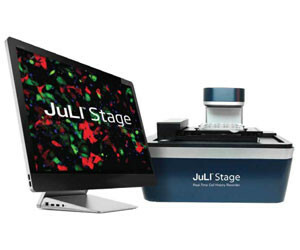 ATA Scientific is the local distributor for the NanoEnTek JuLI Stage live cell imaging and analysis system. The company offers ongoing applications assistance and a range of technical services, including operator training and preventative maintenance. I am interested in NanoEnTek JuLI Stage real-time cell history recorder .